So Croak isn’t really a sports book. The only mentions of sports in the book is when they discuss which New York baseball team the main character follows and when there is a death at a baseball game. 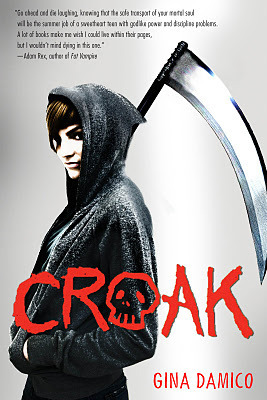 Croak is getting mention here because the author, Gina Damico, is a friend of the site and the woman who, for some unknown reason, agreed to marry me. Croak hits shelves today and has now been released upon the world. Look how shiny the cover is... you could fight Medusa with this thing.